India shares with China a common border of 4056 km. China's incursions into Indian territory has been reported around Sikkim , arunachal Pradesh and opposite Ladakh in Jammu and Kashmir. As the international boundary is not marked and the Chinese do not recognise the Mac Mohan line, the LAC (line of actual control) has become the virtual boundary between the two Nations. The problem is interpretation of the line of actual control from the map to the actual ground. Thus, the Chinese have entered the Indian territory opposite Ladakh, sikkim, uttarakhand and arunachal Pradesh. But the same has been denied by the Chinese. The foreign minister and the Government of India have down played these incidents. 1. Asylum given to the dalai Lama by Indian government in 1959. The Chinese think the former is inciting the tibeteans against the Chinese. 2. China's rejection of Mac Mohan line as border between India and Tibet. 3. Issue of Sikkim, which the Chinese think was forcibly taken over by India, even now claiming 2.1 square kilometre of territory called area finger. 4. Claiming whole of Arunachal Pradesh as part of Tibet (having 90000 square kilometres). 5. Blocking funds for the development of Arunachal Pradesh from Asian Development Bank by contesting that World Bank cannot give funds for disputed areas. 6. Try to block the exemption to India at the meeting of nuclear supplier group. 7. Denying visa to Arunachal Pradesh residents on the ground they do not require any Visa to visit China as they are Chinese citizens. 8. Recently issuing visas to people from Jammu and Kashmir as staple visa and not stamped Visa on the passport. The reason these people are from disputed territory. The trade between two countries is developing. It has touched 67 billion dollar in 2014 and almost touched 140 billion dollar in 2017. No major clash between armed forces reported. Joint military exercise organised by both the countries. Indian naval Ships visited China during the celebration of 60 years of revolution. Indian tourist visit China in big way. India is a major supplier of services in banking, insurance and software engineers. Goodwill visit by Senior defence officer to China and Tibet to promote confidence between the two countries. Sharing of information on melting of glaciers on Tibet. India and China are the emerging economy of the world. Both have grown in population as number one and number two of the world. Indo China’s boundary spread over 5 Indian states has to be resolved. The spirit of Panchsheel has to be injected to solve this problem. India has to check the moves of Dalai Lama so that our relations do not suffer. We both, must grow as companions and not as opponent's. India is also caring to build its infrastructure so that it is not surprised like 1962. India and China join hands to fight terrorism, global warming and recovery of economy which are the burning issues for the world. According to Defence Minister report released on August 21 2011, the centre has given in principle approval to strengthening defence along the line of actual control, the 4057 km line that demarcates the SINO- India border. The node was given apparently to counter the muscle flexing by China, which has been shoring up hits military capacity in Tibet. India's plans include raising a new army corps at panagarh in West Bengal, armoured brigade each in eastern Sikkim and Eastern Ladakh and an independent infantry brigade in the barahoti plains in Uttarakhand. The strategic step was taken in the light of China's present capability to deploy no less than 34 divisions( nearly half a million Troops) within a month along the line of actual control thanks to use infrastructure build up in Tibet. India's worries have been compounded by the fact that the Chinese peoples liberation Army has been conducting Airborne, paratrooping and artillery firing exercises in Tibet for the last 2 years. The Panagarh best corps will include a Ranchi based formation, which is currently part of the Mathura based corps. The army will raise to more divisions in the coming years to replenish mathura corps to add to the Panagarh formation. Already a 6000 acre area which has a functioning airstrips has been here marked in Panagarh. Besides a battalion and a tank progate which will be part of the armoured Brigade have already been moved to Sikkim. The line of actual control is the 4057 km line that demarcates the SINO INDIAN border. The nod for defence Beef Up was given to counter China is growing military capacity along the line of actual control. India's plans include raising a new army corp in West Bengal an armoured Brigade age in Sikkim and Ladakh and an brigade in Uttarakhand. Historically india and China have had cordial relations for more than 2000 years. The traditional Silk Road not only served as a route for trade but also promoted the spread of Buddhism from India to China. Modern relationship between the two countries begin in 1950. When India was among us the five countries to end formal ties with the Republic of China( taiwan) and recognise the people's Republic China as the legitimate government of mainland China. On August 15 1947, india became an independent from British rule and became a federal, Democratic Republic.On 1st October 1949 the People's Liberation Army defeated the Nationalist Party of China in a civil war and established the People's Republic of China. Mao zedong the commander of Liberation army and the chairman of Communist Party of China viewed Tibet as an integral part of the China state and was determined to bring Tibet under its direct administrative and military control. Tibet serves as buffer zone between India and China. India regarded the Chinese forceful occupation of Tibet as an interference in the internal affairs of People's Republic of China. In order to avoid antagonizing the peoples republic of China, india broker and agreement between Tibet and China, where tibetan delegates signed an agreement in may 1951 recognising people Republic of China sovereignty but guaranteeing that the existing political and social system of Tibet would continue. In April 1954 india and the people Republic of China signed and 8 year agreement on Tibet that set forth the basis of their relationship in the form of the Panchsheel or the five principles of peaceful coexistence. The critics of the Panchsheel agreement call this as a naive act of Indian prime minister Nehru, that in absence of credible military wherewitthal or a clear policy for defence of Himalayan region, he saw this as India's best guarantee of security by way of establishing a psychological buffer zone in place of the Lost physical buffer of Tibet. Consequently up until 1959 despite border skirmishes and discrepancies between Indian and Chinese maps, is leaders amicably assured India that there was no territorial controversy on the border and on the other hand India awarded bringing up the border issue in high level meetings. India providing Asylum to the Tibetan had Dalai Lama and thousands of refugees who sought sanctuary in Dharamshala and in Indian north east States, served as a trigger for the People's Republic of China accusing India of expansionism in to Tibet and throughout the Himalayan region. China claimed 104000 square kilometre of territory over which India's map showed players on unity and demanded rectification of the entire border. China made a proposal to India that it would relinquish its claim to most of India's Northeast in exchange for India's abandonment of its claim to Aksai chin. The Indian government rejected the idea of a settlement based on uncompensated loss of territory as being humiliating and unequal. In 1962 border disputes resulted in a short border war between the china and India on 20 October 1962. The border clash resulted in a crushing defeating of India as the people's Republic of China post the Indian forces to within 48 kilometres of the Assam planes in the Northeast and also occupied strategic points in Ladakh. Finally on 21st November 1962 people Republic of China declared a unilateral ceasefire and withdrew 20 km behind its contended Line of Control. In late 1967 there were two skirmishes between Indian and Chinese forces in Sikkim. The first one was dubbed the nathula incident and the other the Chola incident, heavy fire took place at Sikkim outpost. During the whole conflict indian losses were 88 killed and 163 wounded, while Chinese casualties world 300 killed and 450 wounded in Nathula and 40 in chOla. In 1967, a peasant uprising broke out in naksalbari, I promaoist elements. Pronunciation by mao titled " spring thunder over India" gave full moral support for the Uprising. However as the Naxalite Movement disintegrated, the PRC withdrew its political sport and turned non-committal towards the various Indian groups. During the 1971 conflict with Pakistan, chinese provided them with military and moral support. In fact even now a lot of military hardware held with Pakistan is of Chinese origin. In 1980 Indian Prime Minister Indira Gandhi approved a plan to upgrade the deployment of forces around the line of actual control to avoid unilateral redefinition of line. India also increased funds for infrastructural development in These areas. In 1984 squads of Indian soldiers begin actively patrolling the sumdorong Chu Valley in Arunachal Pradesh which is north of Mac Mohan line is drawn on Shimla Treaty map. The Indian team left the area before the winter. In the winter of 1986 the Chinese deployed their trips to the sumdorong Chu before the Indian team could arrive in the summer and had built a helipad at wandu. In 1986 India's grant of statehood To Arunachal Pradesh (formerly north East frontier agency) in February 1987 caused both sides to deploy new troops to the area raising tension and fear of a new border war. The People's Republic of China relayed warnings that it would " teach India a lesson" if it did not cease " nibbling" at Chinese territory. Progress was also made in a reducing tensions on the border of via confidence building measures including mutual through productions and regular meetings of local military commanders and advanced notification of military exercises. Border trade resumed in July 1992 after a gap of more than 30 years, consulates reopened in Bombay and shanghai in December 1992 and in June 1993 the two sides agreed to open an additional border trading post. China eventually recognised Sikkim as an Indian state in 2003 on the condition that India accepted Tibet autonomous region as a part of China. this mutual agreement lead to great improvement the scene of Indian relation. The year 2004 was a milestone in SINO Indian bilateral trade surfacing the 10 million US dollar mark for the first time. In April 2005 Chinese premier Wen Jiabao visited Bangalore to push for increased Sino- corporation in HITECH industries. Regarding the issue of India gaining a permanent seat on the UN Security Council, on his visit, Wen jiabao initially seemed to support the idea, but had a return to a neutral position on the subject by the time he returned to China. on July 6 2006, china and India after 44 years reopened Nathula, and ancient trade route which was part of the Silk Road and had been closed since the Sino- India war broke out in 1962. In November 2006, china and India had a verbal Spat over claim of the Northeast Indian state of Arunachal Pradesh. India claimed that China was occupying 38000 square kilometre of its territory in Kashmir, while China claim the whole of Arunachal Pradesh as its own. In may 2007, China denied the application for Visa from an IAS officer in Arunachal Pradesh. According to China since Arunachal Pradesh is a Territory of China he would not need a visa to visit his own country. In January 2008, prime Minister Manmohan Singh visited China and met with President Hu Jintao and premiere Wen Jiabao and had bilateral discussion related to trade, commerce, defence, military and various other issues. In October 2009, asian Development Bank formally acknowledging Arunachal Pradesh as a part of India approved a loan to India for a development project there, earlier china had exercised pressure on the bank to cease the loan. In April 2011, during the BRICS summit in China, the two countries agreed to restore defence cooperation and China had hinted that it may rivers its policy of administering staples visas to resident of Jammu and Kashmir. Lateral trade between the two countries reached 73 million dollar in 2011, making china india's largest trade partner, but sleep to 66 billian dollar in 2012. It is expected that trade between these two Asian economic powers will reach 150 bilion US dollars by 2020. A3 week standoff between indian and Chinese troops in close proximity to each other and the line of actual control in Ladakh region and AkSiachen was refused on 5 may 2013. The Chinese agreed to withdraw their troops in exchange for an Indian agreement to demolish several " live in bunkers" 250 km to the South in the disputed Chumar sector. Chinese Premier Li Keqiang made his first foreign visit to India on 18 may 2013 in a bid to resolve border disputes and to stimulate economic relations. There have also been speculations on Indian side on how to tackle the rising trade deficit with China which currently stands up at 40 billion dollar. 1. India and China have signed 12 agreements in Delhi on which will see China investing 20 billion dollar in India's infrastructure over 5 years and give its companies greater access to key Chinese markets. Bring India's aging Railway system up to date with high speed links and upgraded railway stations. set up industrial parks in Gujarat and Maharashtra. india and China signed a five year plan to promote trade rejection. Give More market access to India to Products including Pharmaceutical and farm products. 3. New road to Kailash Mansarovar via Nathula agreed upon. 4. China will set up two industrial parks in India 14 power equipment in Gujarat and another for automatic parts in the Western Maharashtra state. 5. India and China decide to initiate talks on civil nuclear cooperation. 6. New investments from China could help India reduce its trade deficit. 7. China support India's full membership in Shanghai cooperation organisation. 8. Both sides have agreed that the year 2015 will be the year to visit India in China and 2006 will the year to visit China in India. 9. Indian and Chinese companies have also signed deals worth more than 3 billion dollar in Aircraft leasing and telecoms among other sectors. 10. 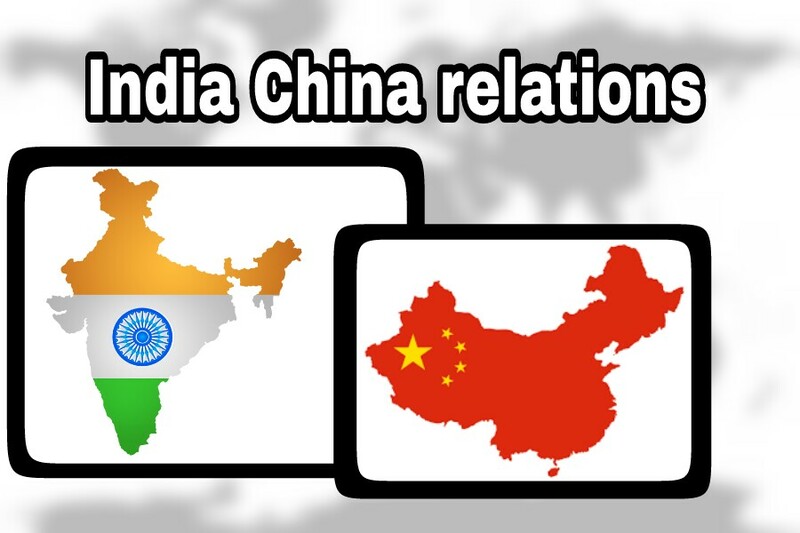 Despite the continuing tension, trade between India and China has risen to almost 70 billion dollars a year, although India's trade deficit with China has climb to more than 40 million dollar from 1 billion in 2001 to 2002. India China standoff in Sumar in Ladakh during Chinese President Xi Jinping's visit to India. More than 200 soldiers of the People's Liberation Army entered what India considers its territory and used cranes and Bulldozers to build a 1.2 Mile Road. Indian Soldiers challenged chinese Troops and ask them to withdraw before demolishing a temporary track they had built. Standoff along line of actual control in Ladakh China has demanded that the Indian Army give up construction of a road which they have plan to build along the undefined border. The Chinese side had been constructing a road on their side of line of actual control but its workers entered into Indian size to carry on the construction. This was objective by the Indian side as Chinese workers were making assumptions that they have instruction to build a road 5 kilometres deep into Indian territory. The Indian Army ask the Chinese workers to leave as otherwise they would face prosecution under Indian laws of entering into the country illegally. India destroyed a part of the new road and promptly raised troops number in area. After flag meetings between the two Armies The situation is now normal. China does not accept the mac Mohan line as the legal delineation between India and China. It says that this was a demarcation agreed upon between british Raj and Tibet. There is no clear demarcation of the boundaries thereby leading to errors of perception and understanding of previous agreements. incursions from China continue despite protest and meetings by India. The intrusion are well coordinated and show not interest by the People's Liberation Army in area of military significance. China has highly developed surface and Air Communication facilities all along the Tibetan autonomous region specially opposite Arunachal Pradesh and is in the process of preparing a dozen more airports in Tibet. Indian side on the other hand is highly underdeveloped with difficult Terrain and therefore build up moment and reinforcement of Brooks will be laborious and time consuming. Assertive stance of China on the border is an indicator that it wants to state its territorial claims and also dissuade india from building up infrastructure along the border. Also buy slowly biting in two piece of Indian territory through continuous intrusion the Chinese are observing how India's political leadership and its security forces react to such provocations. The People's Liberation Army is training for short and shift conflict preceded by a cyber offensive. And offensive code involve the use of missiles anti-satellite weapons overwhelming firepower and control over the air space. The extent and scale of conflict would depend on Chinese motives and intent. China's largest strategy is to isolate India and keep it confined to back waters of South Asia throw its policy of establishing a string of pearls by increasing its influence over the whole neighbours of India like Nepal, Sri Lanka, Myanmar, Bangladesh, Maldives, Bhutan and of course with its all time rival Pakistan. What should be India's stance against Chinese location? It is only through a strong show of force and defence preparedness that the integrity of our borders can be maintained. Hans India has to move from a policy of dissuasion to that of credible deterrence. If we compare the military strength of China and India, china age nearly 2 to 3 times to that of India. So the question arises how do we adopt the policy of credible deterrence? diplomatically india mast proactively resolve all issues and differences with Bangladesh, nepal, sri Lanka, myanmar and Bhutan. The invitation to all SAARC members by our new PM during his swearing in ceremony was a step in this direction. we need to actively pursue our act East policy by engaging all southeast Asian nations who have clashing interest with China in the South China Sea. similarly engaging a heavyweight like Japan in trade and diplomatic ties will serve as a counterweight against China explainsionism. Specially when China Japan relations are at its worst because of the dispute over the control of senkaku island in the East China Sea. Hawa PM''s visit to Japan is at this juncture is a diplomatic masterstroke. indian economy needs to be exported drive rather than import drive to be able to offset the trade deficit with China. besides the above actions, military India needs to improve its force level along the line of actual control and north east border with China; a new mountain Corps is being raised to meet this explicit requirement. at the tactical level there must be a renewed Emphasis laid on patrolling and surveillance using satellites, unmanned aerial vehicles and battlefield surveillance radar. So as to appear more assertive and forceful in projecting its footprints. deployment of strategic assets keeping the threat perception in mind, will serve as a serious different and a threat in bing. Agni 5 missile must be operationalised earliest by for deployment with the strategic forces. last but not the least, considering that China is our largest trading partner we must continuously engaged China into meaningful talks and sincerely endeavour to resolve the long outstanding border disputes amicably. This is my first visit to this website. You have really good material.